The event, held 26 – 28 September, sees a wealth of world-class suppliers come together to share and discuss the latest products, market trends and trade secrets. Russell Finex will present its range of innovative and award-winning industrial separation solutions suitable for a variety of processing industries. PPMA is the UK's trade association for suppliers of processing and packaging machinery to the UK market and represents over 480 member and associate companies. The association promotes its members’ products and services both at home and abroad, as well as providing free technical and machinery information and advice, and sharing the latest industry developments and technologies. As its flagship event, PPMA Show provides the perfect opportunity for PPMA members and associates as well as other exhibitors and visitors to share knowledge and discuss their latest ideas and advancements, as manufacturers continue to drive the process industry forward both at home and abroad. Russell Finex is looking forward to attending this landmark event, and showcasing the latest separation equipment, whilst offering the perfect chance for visitors to view, discuss and try the latest sieving and filtration solutions. PPMA Show also coincides with the PPMA Group Industry Awards and, having been successful in winning two awards at last year’s event, Russell Finex is looking forward to hopefully enjoying further success this time around. •	The Russell Screen Changer™ - The winner of the PPMA Group 2016 Most Innovative Ancillary Equipment Award, this screen deck lifting device improves operator safety and usability, plus reduces production downtime. The easy-upgrade design is retrofittable to any round separator, and can be easily transferred from one to another. •	Russell Gated Outlet™ - Controls the flow of product from the oversize outlet, improving productivity by ensuring the product is screened efficiently. •	Russell Vibrasonic® Deblinding System - This ultrasonic screening technology enables fine mesh sieving – down to 20 micron - of difficult powders. By applying an ultrasonic frequency to the screen, mesh blockage is eliminated, meaning increased sieving throughput, increasing production rates. 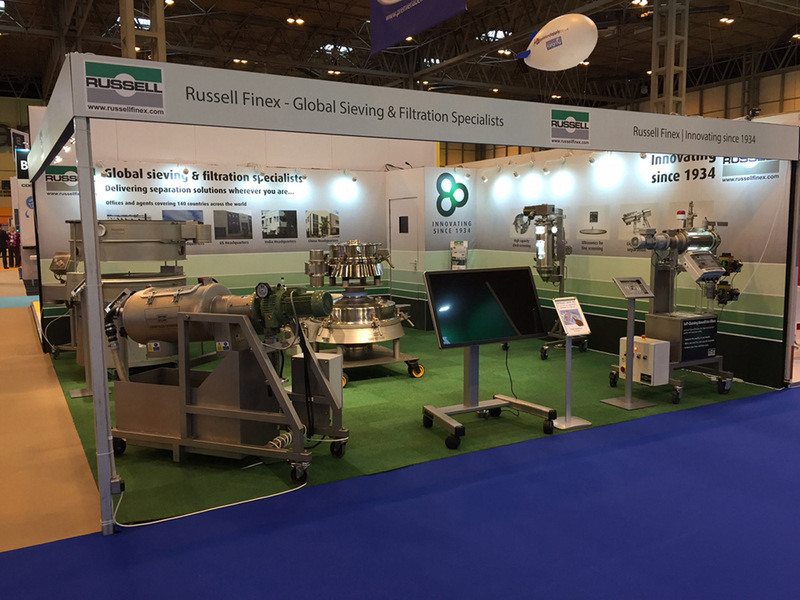 Visit Russell Finex at Stand B40 to find out how a range of innovative and customizable separation solutions and upgrades could benefit your production line, or try the online Interactive Application Finder now.